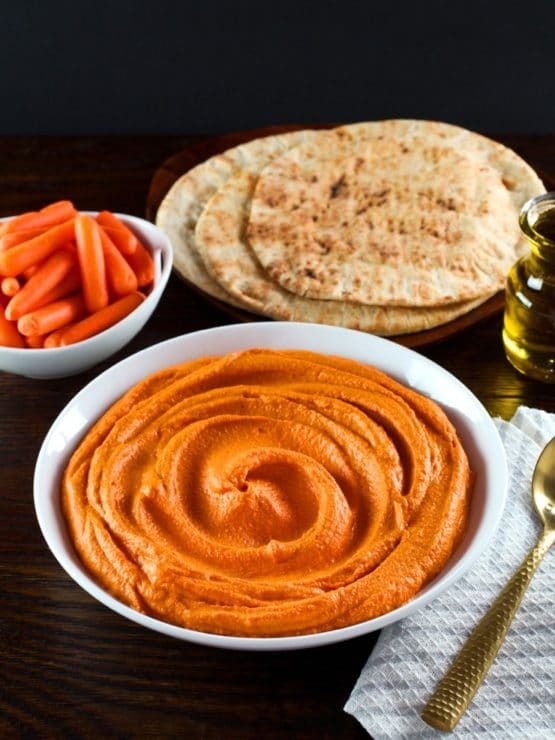 We make a lot of hummus in my home, and this Roasted Red Pepper Hummus is one of our favorite variations. 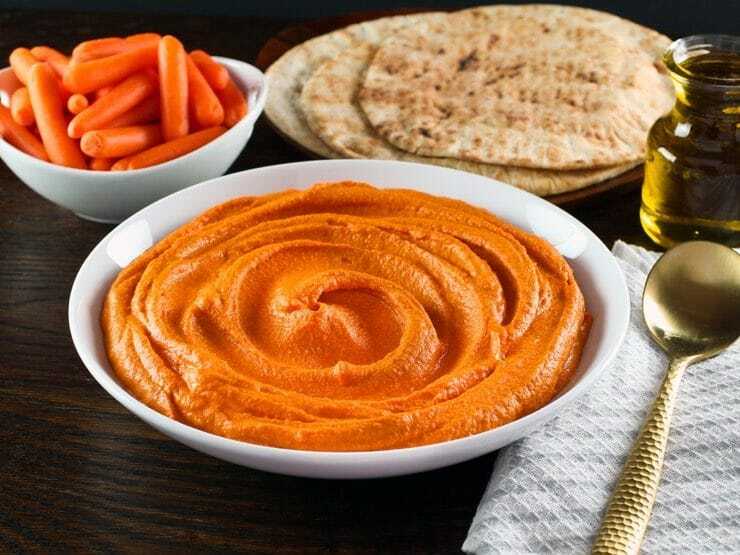 Smoky, peppery, garlicky, and sweet with a kick of spice, this silky smooth hummus is a flavor sensation. Hummus is the ultimate healthy snack to have on hand… it’s loaded with protein, fiber, and heart-healthy fat. It’s really filling, which means it will help curb your appetite between meals. All that, and it happens to taste amazing. Adding roasted red peppers to the mix is a great way to change things up. I’ve made red pepper hummus before, but always found it somewhat dull… until I hit upon the perfect combination of flavors that took this hummus from good to “oh em gee” amazing. First I roasted the peppers, which made them soft and smoky. I peeled the chickpeas before processing, which helped the hummus turn ultra smooth and creamy (you don’t have to do that step, if you don’t have the patience… I love the texture it gives). Then I added fresh garlic and lemon juice, salt and a little tahini. Finally, the two magic ingredients that took this hummus to another level– smoked paprika and cayenne. The smoked paprika enhanced the natural smoky flavor of the roasted peppers, and the cayenne gave it a little kick of spice that made it all come together in perfect harmony. Delish! This hummus is creamy, smoky, spicy, sweet, garlicky goodness… a flavorful “twist” on an old favorite. Enjoy! Hummus made with roasted red bell peppers, tahini and spices. 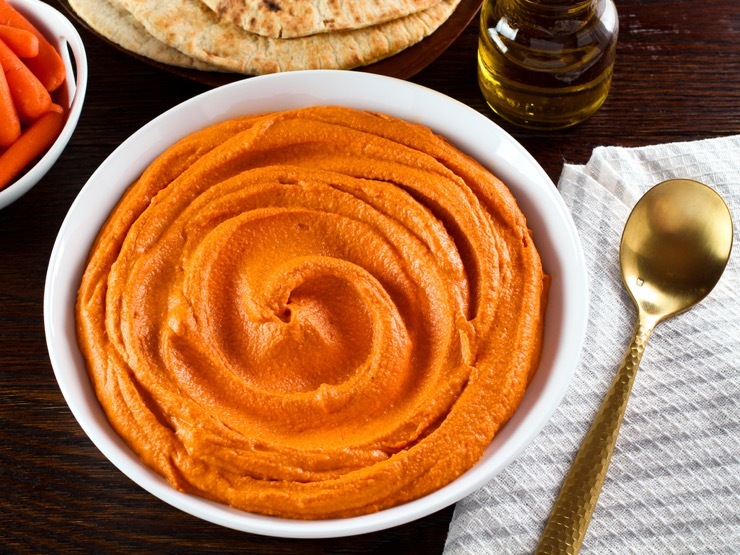 This hummus is creamy, smoky, slightly sweet and spicy, garlicky goodness! 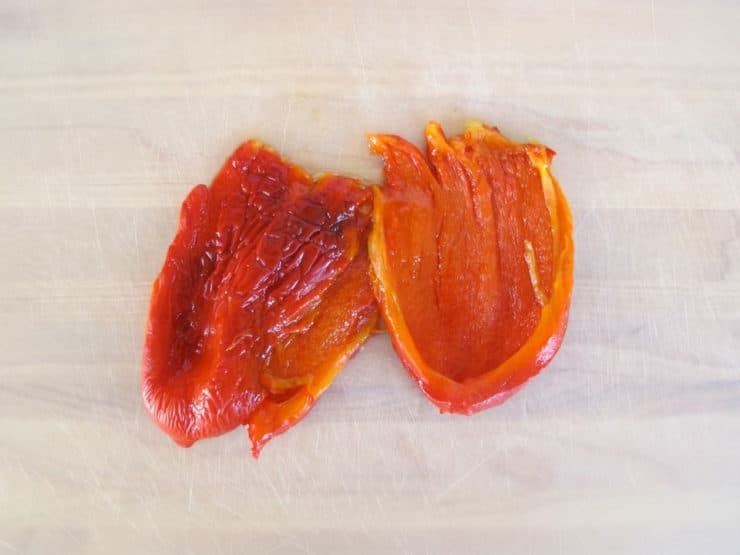 Use jarred roasted red peppers (drained), or make your own. For instructions on making homemade roasted peppers, click here. 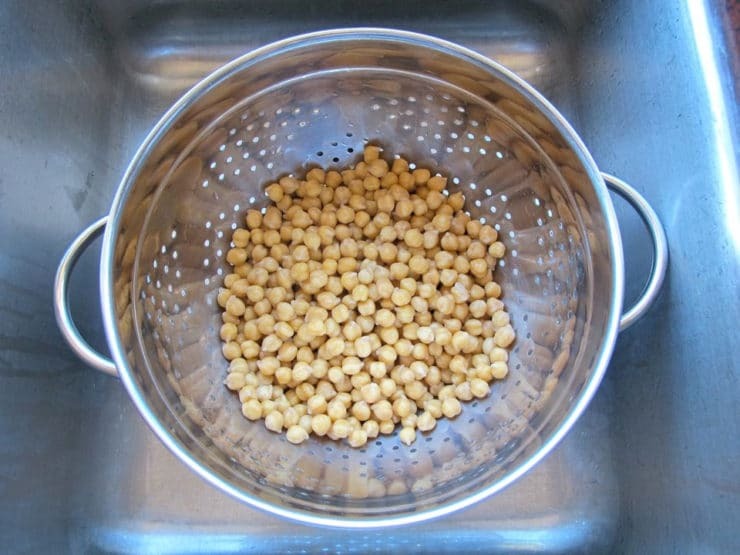 If using canned chickpeas, drain them and rinse them. If using dried chickpeas, drain and rinse them after soaking, then simmer them in lightly salted water on the stovetop for 60-90 minutes until soft and tender. Drain the beans and allow to cool to room temperature. For more detailed instructions, click here. To make this hummus ultra creamy, you can peel the cooked chickpeas. 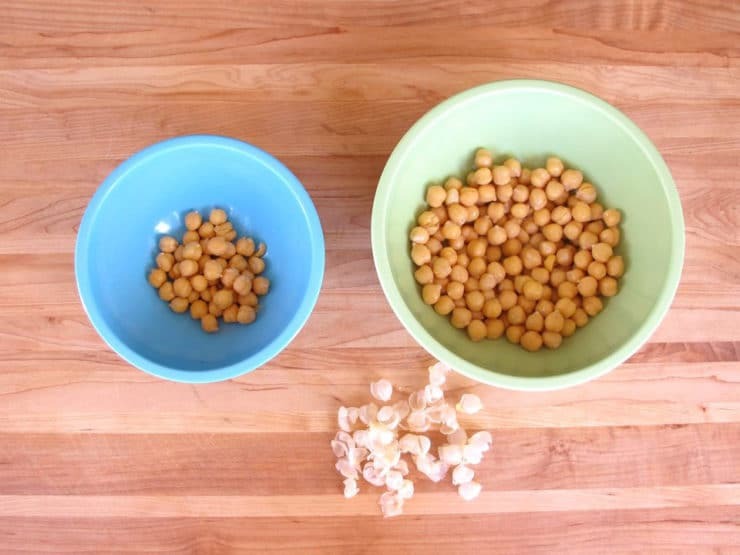 Squeeze each chickpea gently to remove the skin, then discard the skins before processing. While this step is not completely necessary, it will ensure that your hummus turns out very smooth and creamy. Outfit your food processor with a blade attachment. 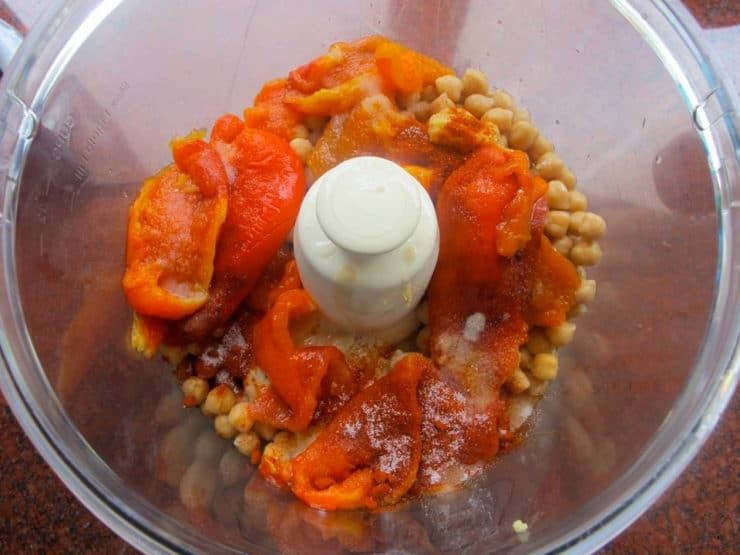 Combine roasted peppers, chickpeas, tahini paste, olive oil, lemon juice, garlic and spices in the processor. Pour into a serving bowl and chill thoroughly before stirring. Hummus will firm up slightly as it chills. 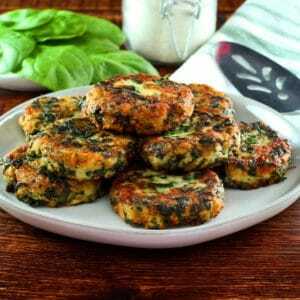 Goes great with grilled pita bread, pita chips, crackers or crudites. So easy and so delicious. You can stand at your counter and have hummus in less than 3 songs on Pandora, plus you can taste test as you go. Make sure you have a rubber spatula to scrape the sides of the mixer. I used a jar of cooked peppers from the store. We need to try this in different flavors! Maybe spinach, nuts or caramelized onions. Thanks for a great recipe! I roasted my peppers and also made the tahini from scratch, with awesome results. I used two 19-oz (540 ml) cans of chickpeas, because that’s how the cans are sold here in Canada. Added 4 tbsp of water when processing for the right consistency. I don’t imagine there will be much left, if any, with the company we’re having tonight. 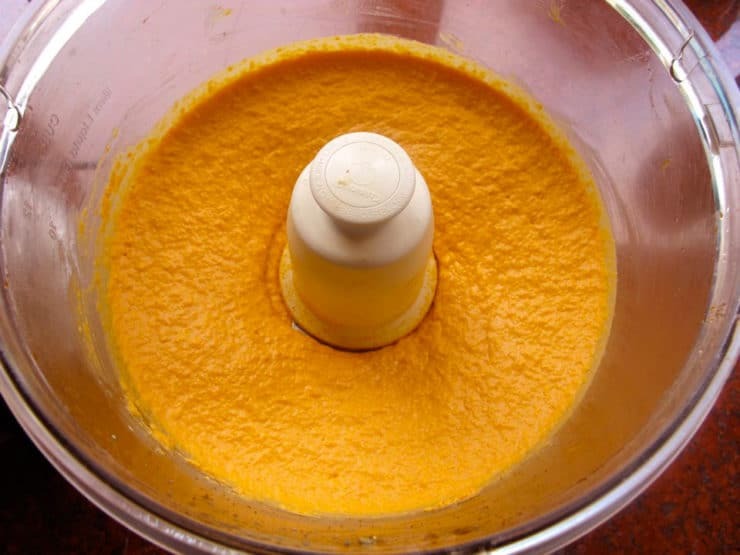 I have had this recipe just now….and it’s so delicious, sweet, lightly spiced…OMG….and I made my tahini past too….. I have a question for you…..Could you tell me how time I could freeze this recipe…..
Glad you liked it Zoraida! 🙂 Yes it can be frozen. Place it in a freezer-safe container, pour a thin layer of olive oil over the top, and freeze for up to four months… the less time you freeze it, the better it will taste. You’ll need to stir it when you thaw. I am a hummus “snob” and this was amazing!! I did add a bit more garlic and paprika, along with additional salt, and a little fresh jalapeno, just because I am serving this with a very spicy Indian main course. Directions and recipe are perfect. My new “go to” base hummus recipe. Thank you! Oh, and I DID take time to peel my chick peas, IMHO, you just can’t skip this step. 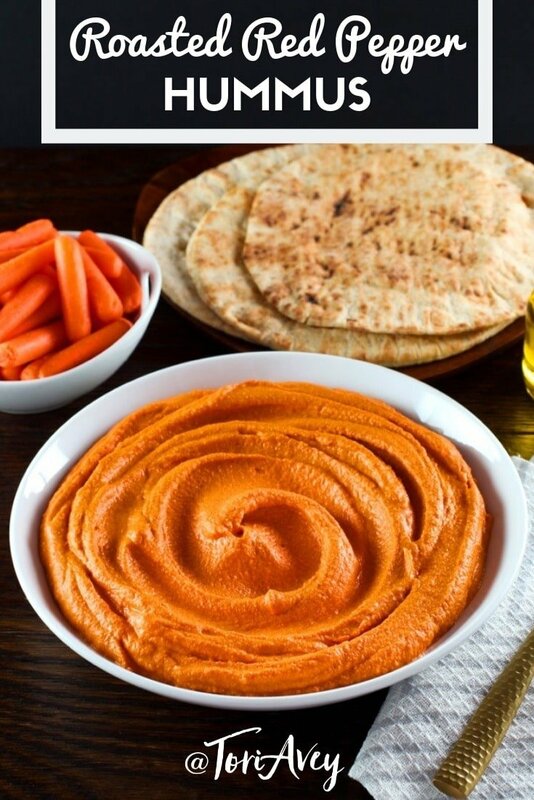 I’ve been making hummus for a couple of years and this is my favorite recipe! Really delicious and umami. If you’ve never made hummus before–you should know the brand of tahini matters. I personally favor Shirley Bar; do NOT like Once Again (it tastes like peanut butter). Love this hummus!! Just one thing! I’m th only one in the house that eats hummus , how long does it keep in the fridge?? Hi Liv, Tori’s assistant Ashley here. I wouldn’t keep the hummus for more than a week. You can freeze hummus. I’ve done it when I made too much. Let it defrost in the fridge. Tastes like you just made it! This Hummus is delicious! I made a few changes: About 6 cloves garlic, a full tsp. paprika, a 1/2 tsp cumin, also used a 1/2 tsp. for cayenne and about a half a large roasted jalapeno, along with my (first) home roasted red peppers! The results are awesome! Thank you for sharing a wonderful recipe. It’s going in my “old school” recipe box! This could be my new favorite hummus recipe. 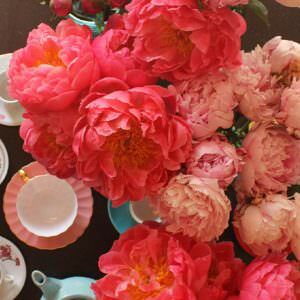 Reminds me of pimiento cheese without the cheese. Very easy – will definitely make this regularly. So I made this AGAIN and this time had to skin those little chickpeas myself. OY! I just wanted to add…I throw in Trader Joe’s Tahini Sauce in lieu of tahini. I hate buying tahini as it sits around too long so like using Trader Joe’s Tahini Sauce in my hummus. When I bought it I was told “it’s not for making hummus”. I disagree. Note that Trader Joe’s Tahini Sauce has lemon and garlic if you decide to use it. I do not add additional salt because the tahini sauce is quite salty but still add a lot of my own lemon juice and garlic because that’s how we like it. I loved it! I have made it many times already! I just bought a large bag of roasted garlic pieces and was wondering if I could use this in the recipe instead of fresh? Yes you can, if the roasted garlic is unflavored and unmarinated – simple roasted garlic packed in oil will work fine. I’ve denuded 2lbs of lima beans but I must say denuding chickpeas, at least the lit-tle ones I ended up with, was tedious. Hubby helped. Would I do it again? Yes. Delicious. I purchased a red pepper hummus in an organic store which I liked so was inspired to make my own. My husband said this was better. Thanks! Gotta find fatter chickpeas. I know they are out there because the ones I happened to have were the smallest I’ve ever seen. I don’t use canned chickpeas anymore. I can’t believe I’ve spent my Sunday morning peeling chick peas too!!!!! Yup, I do it too, now. I’ve made this recipe several times now and it’s my go to recipe for hummus. With carrot sticks it’s a healthy snack that’s a regular in my fridge now. Substitute any (or a combination of all) of your daughter’s favorite spices and herbs for the garlic. I presume this mean “Cumin” since your specifically mentioned it. This link goes to a Bing Search for “Substitutes for people who are allergic to garlic”. 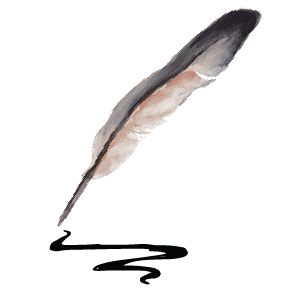 (However, you might want to double check some of these as the substitutes may also be less than desirable”. 7. Store yours in the appropriate container. 8. Enjoy per your usual modus operandi. I absolutely adore garlic in my hummus, but my daughter is allergic (all my tears). Any thoughts on using cumin as a substitute? 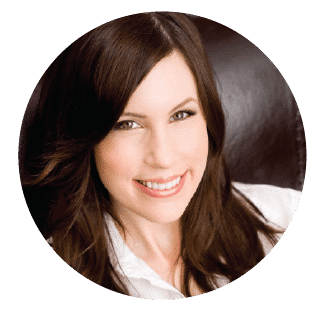 Hi Amy– is she truly allergic or does she have a sensitivity? I had a strong sensitivity to garlic and thought I couldn’t eat it at all, but slowly built up a tolerance over time. Roasting the garlic helps immensely; I still have issues with raw garlic, but roasted is less of an issue (and taking Tums really helps!). If it’s a true food allergy and she cannot have garlic, this hummus will actually have plenty of flavor without it. You want to be careful with cumin, I wouldn’t add more than what is here– too much can produce a very sharp, bitter taste in the food. You can play around with adding other spices to change up the flavor and add depth– I’m thinking a little turmeric might work well here. Hope that helps! At 58, I am pretty new to the food thing, but when I began putting raw ingredients together w/o also adding the heat element to it, I learned that (and I wanted so desperately to be a foodie) the cause of my sensitivity to garlic was the very core…the green part…of the clove. I began removing that and have had no issues since. I’m a foodie. Glad to have found your site!!!!!!!! Just finished making this. It is delicious! Thanks for a great, authentic tasting recipe. I tried removing the skins from the cooked chick peas. Must be the best tip I have gotten in ages! It makes the hummus less lumpy, and just improves it very much. Is it possible it makes hummus more digestible? Whatever, it tastes great to my family and is added to my recipe. Thank you! This sounds really great! I don’t have the patience to peel the garbanzos, but I’m impressed you roasted your own peppers. Yum! This sounds so good!! Love this idea! 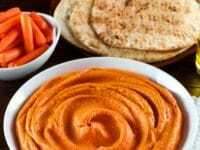 My kids hate red pepper hummus so i never make it, just garlic hummus but if i buy it i often like the variety pack that has spicy versions! I made an onion dip for veggies before dinner today! I have made a similar one, but being lazy, used canned chickpeas and the bottled roasted red pepper. Instead of the lemon juice, try it with a bit of orange (or just add some grated orange peel) for another change of taste. Pretty doggoned yummy. On your virtual recipe card, the title says: “Roasted Rep Pepper Cashew Hummus”, but I don’t see where cashews have anything to do with this recipe. ??? Thanks for pointing that out! I’ve corrected the post. No cashews. Originally I made this hummus with soaked cashews instead of tahini, but I found the flavor too sweet, so I tried again using tahini and it was way better. Must have forgotten to remove “cashew” from the recipe card!! Hi! I’m a new reader and I can tell from even just the last few posts that I’m going to be making a ton of your recipes. 🙂 Thanks! I´d eat that whole bowl up with only that very spoon pictured there. There´s one at the market here that has 4 spices in it. It´s hotter than hell and addictive. I love it. YUM. does anyone know a brand of pita chip that is not soooo very hard ?? ?